Movies, apps, games, e-books, and more - enjoy them all on the hottest device in town - the Kindle Fire HD! From its stunning color touchscreen to its ultrafast speed, the Kindle Fire HD is sparking everyone's interest. This full-color guide will have you blazing through the web, staying entertained with the latest apps and games, watching your favorite TV shows and movies, and, of course, reading magazines, newspapers, and books to indulge all your interests. Whether this is your first tablet or you're upgrading from another device, you'll get to know your Kindle Fire HD and rekindle your love of reading with Kindle Fire HD For Dummies! 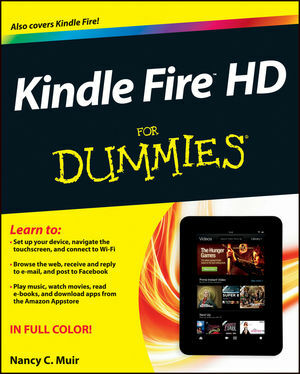 Light 'er up and unleash the fun with Kindle Fire HD For Dummies! Nancy C. Muir is a writer and consultant as well as the author of more than 100 books on business and technology. Her credits include multiple editions of Computers For Seniors For Dummies and Laptops & Tablets For Seniors For Dummies.